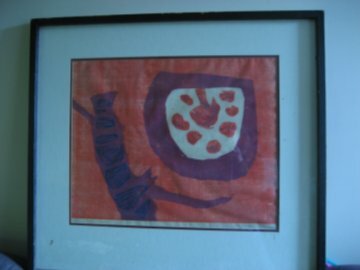 This is an original woodblock print by a west coast beat artist named McGregor Hone. I spotted it peeking out from behind some rather eclectic paintings and posters in a corner stall at the flea market. We talked to the rather eclectic oddities vendor, who gave us some background info on the print, and we told him we’d “have to think about it” because, to be honest, we didn’t come to the flea market expecting to spend that much! Not that it was expensive for an original piece of artwork… And, who knows, it may appreciate with the recent death of its creator. Well, we didn’t actually buy it Saturday when we first went to the flea market, mainly because Eleanor turned out to be a brat that day and we just wanted to get out of there. But, we just couldn’t stop thinking about it and talking about how we needed something beautiful to brighten up our quarters, so we returned Sunday to purchase it, our first piece of real art (no offense to Marshall’s They Might Be Giant Bone Formations). Everyday I love it more and more. The colors are so vibrant. We’re actually thinking now of painting the room to compliment this piece–maybe pick up the dark blue that adorns the thorn on the left. By the way, it’s called Thorn Fruit. Stephen really likes that it has a simple, almost Japanese look about it. It needs a new frame because the one it came in is kind of ratty, but that can be done in time… We intend to keep this baby around for a long time. One of the cool things about being an American in Canada is that you get to celebrate two Thanksgivings. Actually, I didn’t realize there was a separate Canadian Thanksgiving until I moved here. The food is the same: turkey, stuffing, typical autumn harvest fare. But, Canadians only get one day off work instead of two and their Thanksgiving takes place in early October so it doesn’t have that same kicking-off-the-Holiday-season feeling as American Thanksgiving. Historically, though, the Thanksgiving celebrated by Canadians was the first ceremony to give thanks in the New World. It took place in 1578 in the colony of Newfoundland and Labrador, whereas the thanks-giving feast honored in the US first took place in the Virginia colony in 1621. Lucky for us, Eleanor’s passport arrived just days before our slated trip to Seattle where, every year since we moved out here, we have been graciously invited to join Stephen’s aunts and uncles for Thanksgiving dinner. We’re officially an international family now with Eleanor traveling on Canadian documents. (A child’s passport in Canada was just so much easier and cheaper than jumping through the hoops we would have had to jump through to get her an American passport.) I don’t want to name the border crossing that we use, lest it not be so easy-breezy getting through next time, but we go an alternate route bereft of tourists and security threats and sail through every time. Even on Thanksgiving Day, when you’d think there might be a handful of other Americans out there trying to make it down to the homeland for turkey, there was not a single car in line. Now, coming home was a different story. We sailed through going north, but even at our little out-of-the-way border crossing that nobody knows about, there was a line-up half a mile long of Canadians heading south to spend their Big Dollars (that was for you, Dad) on cheap American goods. I wondered what they were going to do–camp out in mall parking lots to be the first in the doors when the stores open at 5am? Thanksgiving dinner was wonderful, thanks to Aunt Sandy and Uncle Wes. They do a great job every year. This year, with little Eleanor about, Sandy got to practice being a grandma and boy will she be a good one one day! She’s the chocolate and ice cream lady, the band-aid-bearing boo-boo fixer. And, she’s got drums and doesn’t care how much noise you make! Eleanor liked banging on the drum set and even made a little music on the piano. By the end of the night, Eleanor was really fond of Sandy. She wanted to be held by her and gave her a hug when we left. She was a perfect little angel. All in all, it was a really nice gathering. I only wish we could get out of the city for longer than a day at a time. But, alas, Stephen had to get back for the final presentation of his Master’s Thesis the very next day. That was yesterday, so he’s done with phase I of his graduate studies! Now on to the PhD. And, we didn’t arrange it like this on purpose, but we actually have a two-day weekend together, so we’re going to check out the Vancouver Flea Market and a winter-harvest farmer’s market that we just heard about. Just counting down the days now until our next big adventure: Christmas in Atlanta with all the Ingrams and a chance to see my own family for a too-brief get-together! In case you haven’t heard, the Vancouver Civic strike is over, which means I have been able to return in recent weeks to the tot gym with Eleanor. Don’t get me wrong, the tot gym is great–all the tricycles and sliding boards I don’t have the money or room for, for the low low price of $2.50 a visit! But, yesterday I tried out the family center’s drop-in preschool for the first time and now I’m kicking myself for not taking Eleanor there sooner. And, it wasn’t even closed during the strike (but I bet it was busy busy busy)! Neighborhood moms had told me a while back about this place where you could go with your kid to play and do crafts. At first, I pooh-poohed getting out and about at 9 in the morning, but fortunately, the end of day light savings time has us in early-bird mode around here (well, it’s either get up an hour earlier to preserve our peaceful mornings without Eleanor or wake up with her and rush rush rush, ’cause she doesn’t seem to get that she could be sleeping in). I assumed I would be asked to at least purchase some kind of membership or pay some dues for the privilege of using their facilities, their paint and craft supplies, their toys and playground. Oh, and there’s free coffee! What does it all cost? A banana! No lie. A banana is what I paid. Every parent brings a piece of fruit that gets cut up and split amongst all the kids at snack time. But, first comes play time! There were kids playing house in one corner, dress-up in another. There was a paint station with several easels beside the playdough table and a crafts table (where Eleanor got glue in her hair). There was a jungle gym were she first tested her strength hanging from the monkey bars and lasted a few seconds before dropping safely to the mat below. For older kids (like 3- and 4-year-olds) there were games and puzzles. Play time was absolute mayhem! They say the afternoon session is much quieter. After play time came singing, for which Eleanor didn’t really want to sit still. She’s never had to learn a time for this and a time for that, since I pretty much follow her schedule at home. Anyway, she cried briefly because I wouldn’t let her run off to the bi-dah (the slide), but she got over it and got excited when she saw one of the nice ladies bringing around plates of fruit. Yay snack time! Oh, and the ladies that work there are sooooooo nice! They did a great job of making me feel welcome as a first-timer and introduced me around (although I recognized a few moms and caretakers from other neighborhood programs and playgrounds). And–get this–since there are paid attendants present, once Eleanor gets more familiar with the place and the people, I’ll be able to leave her in the preschool while I go downstairs and have a coffee in the lounge! For the cost of a single piece of fruit! I’d like to say thank you to the Canadian federal government and the city government of Vancouver for this wonderful service! It’s Halloween night and it sounds like a war zone outside… it has for a few hours now. I don’t remember Halloween being so heavy on fireworks when I was a kid. The candy–thanks Eleanor for the KitKat!–and the costumes are the same. The jack-o-lanterns are pretty much the same and so are the lights except that they’re LED’s. So, when did people start shooting off fireworks on Halloween night? Oh wait… I think even the most innocuous fireworks were illegal in the North Carolina of my childhood.